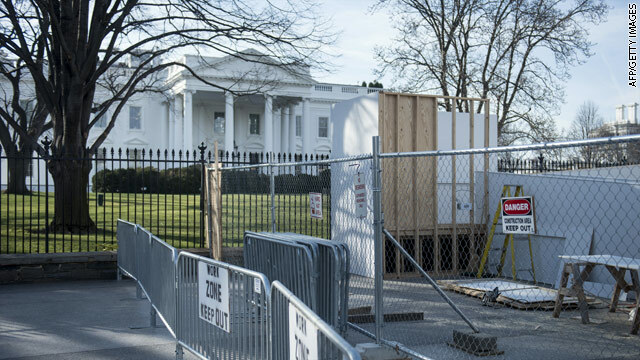 Preparations continue at the White House the Inaugural Parade, which is just ten days away. 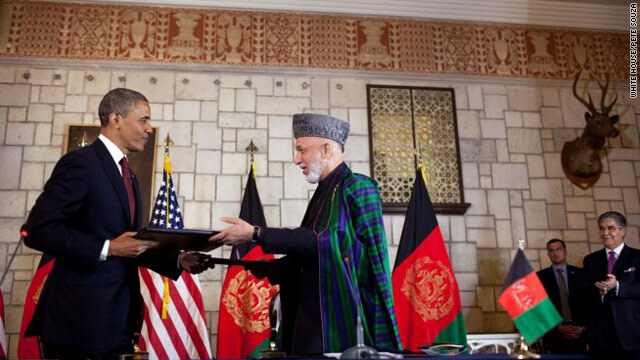 President Obama turns his focus to foreign policy with a visit from Afghan President Hamdi Karzai to wrap up the busy week at the White House. After a bilateral meeting in the morning, the two leaders will have a working lunch followed by a joint press conference. The White House warns us not to expect any firm agreement on troop numbers to come out of today's meeting, but the two leaders will discuss the nature of the U.S. presence in Afghanistan after combat troops leave in 2014. Additionally, the U.S. and Afghanistan are in the middle of negotiating a bilateral security agreement which the White House hopes to make progress on during today's visit. Meanwhile, Vice President Biden continues his work this week with the gun control working group by holding another meeting this afternoon with representatives of the video game industry. Attorney General Eric Holder and HHS Secretary Kathleen Sebelius will join him during the meeting. Vice President Biden said he'll be sending his group's recommendations to the president's desk next week sometime. 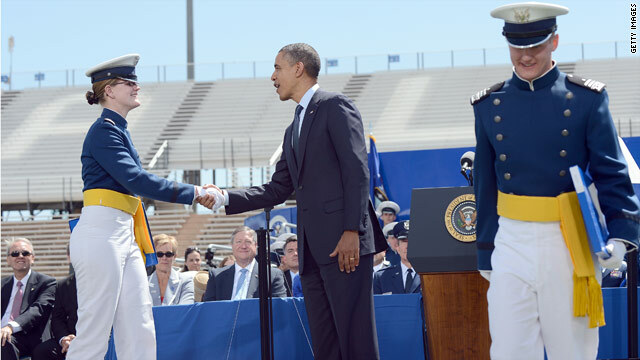 COLORADO SPRINGS, Colorado (CNN) - President Barack Obama delivered a strong defense of his international leadership at the U.S. Air Force Academy on Wednesday, telling graduating cadets they'll be building on "new era of American leadership." 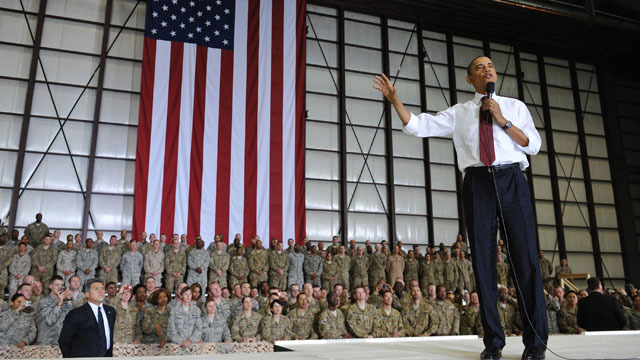 Obama told the incoming corps of second lieutenants they are stepping into "a different world" than the one the United States faced when they entered the academy in 2008. 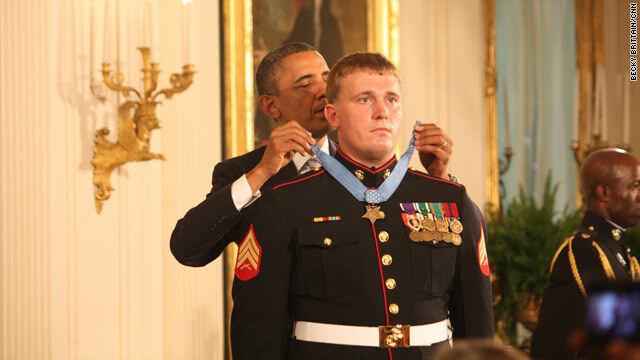 "Four years ago, you arrived here at a time of extraordinary challenge for our nation. Our forces were engaged in two wars. Al Qaeda, which had attacked us on 9/11, was entrenched in their safe havens," he said. "Many of our alliances were strained, and our standing in the world had suffered." Trip to Afghanistan "a scene from a spy novel"
The following is from the pool producer who traveled to Afghanistan with POTUS Tuesday. It was a scene from a spy novel. 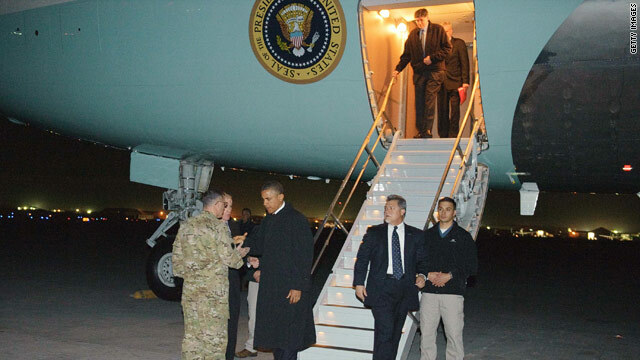 A little after 9:30pm, I arrived at a back gate of Joint Base Andrews. No guard or intercom, I just drove up and it opened. I was in. The security guards verified my identity and I made my way to the rendezvous point. Typically, this would be the base passenger terminal, but not tonight. Very few people knew what we were doing there, so we met in a dimly lit parking lot. Our bags were screened and we gave up all our electronics – laptops, mobile phones, cameras, anything that might have tracking software – were put into bins. We would get them back about an hour after takeoff. On a bus we drove onto the tarmac. Air Force 1 was in shadow. No lights on, inside or out. We boarded. Just before midnight, the President arrived. We didn't see him, but more Secret Service agents boarded, the door was closed, and we were off. No lights on in the cabin for takeoff and initial ascent. All window shades down. In fact, we would not see daylight for more than 24 hours. The plan was to arrive in Afghanistan after dark and leave before daybreak. As we descended steeply to the runway, again, all inside cabin lights were turned off. 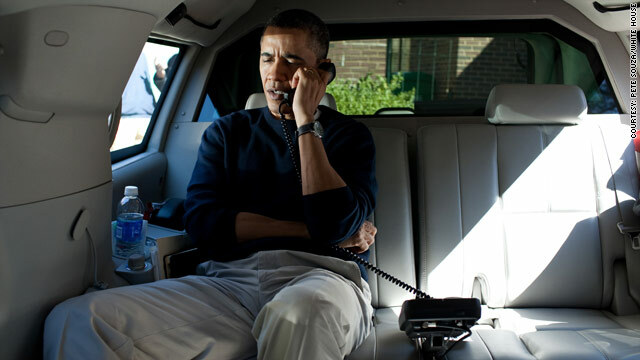 "The President was informed this morning of the incident by his senior national security staff and received a briefing from them early this afternoon before calling President Karzai. This afternoon’s meeting included National Security Advisor Tom Donilon, Deputy National Security Advisor Denis McDonough, and Special Assistant to the President for Afghanistan and Pakistan Doug Lute." 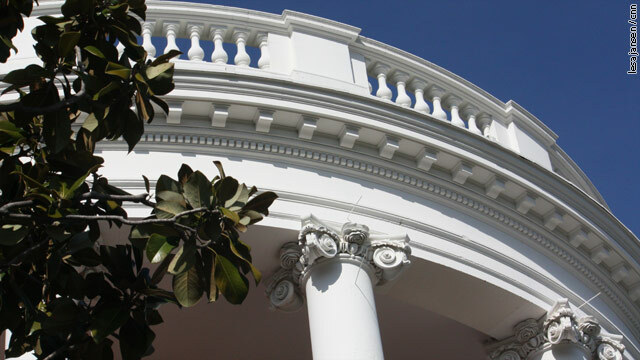 The White House released a written statement from President Obama expressing his condolences to the Afghan people and his desire to fully investigate the incident. "I am deeply saddened by the reported killing and wounding of Afghan civilians. I offer my condolences to the families and loved ones of those who lost their lives, and to the people of Afghanistan, who have endured too much violence and suffering. This incident is tragic and shocking, and does not represent the exceptional character of our military and the respect that the United States has for the people of Afghanistan. I fully support Secretary Panetta’s and General Allen’s commitment to get the facts as quickly as possible and to hold accountable anyone responsible." White House "monitoring the situation closely." After reports that an American service member allegedly shot more than a dozen Afghan civilians in Kandahar province, Jay Carney, White House Press Secretary, said, “We are deeply concerned by the initial reports of this incident, and are monitoring the situation closely." 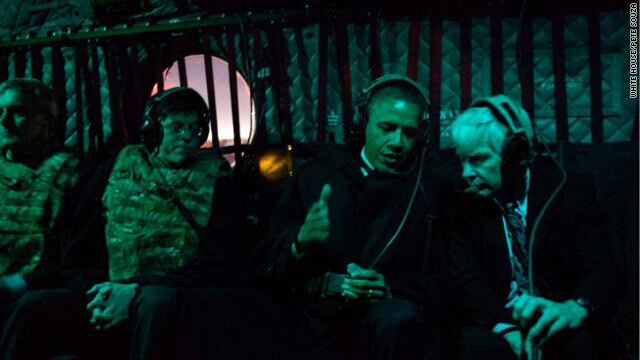 Administration officials confirmed that President Obama had been briefed on the situation.